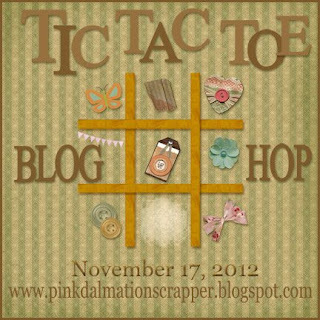 This is a super fun Tic Tac Toe Blog Hop by the Scraps To Treasure Team!! We had to use the Tic Tac Toe board above along with only using your scraps to make a project. I chose to do the bottom row across which includes buttons, mist/paint and ribbon. 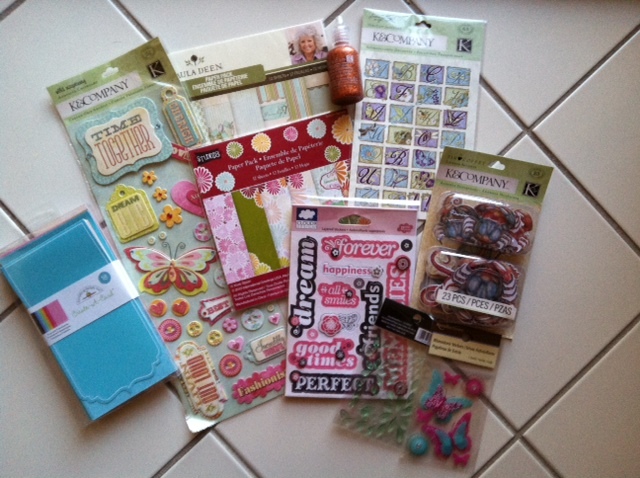 There is blog candy for this hop, but you must comment on everyone's blog in this hop to win. 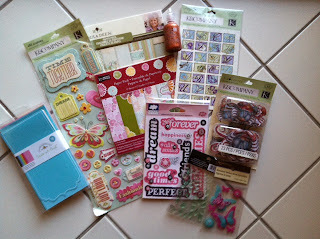 I also have some blog candy that I'll be giving away. If you have arrived from Lucy's you are in the right place. If you just happen to be visiting my blog please start from the beginning. The papers are all from my stash. I always have a ton of buttons so I decided to make a wreath out of buttons. I also added some ribbon and adhesive rhinestones. 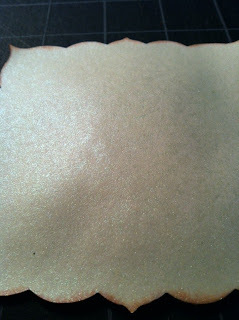 Here's a close up of the paper that the wreath is on. I sprayed a green glimmer mist on the paper. It really does give it a pretty shine. I did ink the edges with Tim Holtz Tea Dye ink. Here's my blog candy for this hop! I will announce the winner by using Random.org on 11/20. This is open to US and Canadian residents only due to shipping charges. Here's a complete list of the lineup in case you get lost. 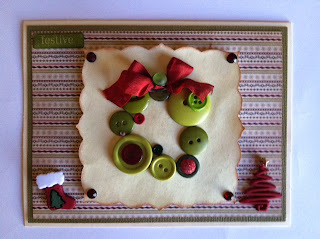 Love this card...the button wreath just pops! Great card. Love the button wreath. Makes a great holiday card. 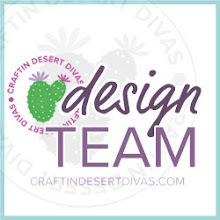 What a cute blog and very cute project! Thanks for hoppin with us! Funny, we chose the same row....love your design. super cute. I love your creative use of buttons! the combination of the inked edging and glimmer mist is really clever, and the wreath is so cute! 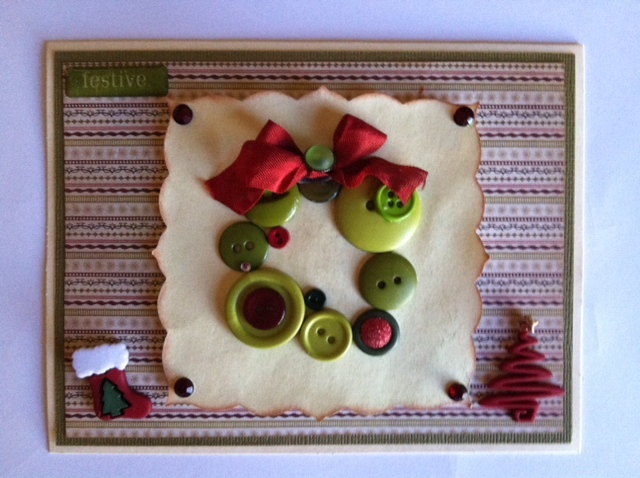 Great card, and love the Button Wreath!! TFS!! I have been a follower here for a while now!! Happy Thanksgiving!! love the button wreath! awesome idea! Tara, tooooo ingenious to use buttons for a wreath. Super cute! TFS! That is just such an adorable button wrteath! I love it and this hop is so cute! 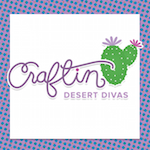 tara-first, I love your blog! Your card is really adorable! So super cute...I love the button wreath, and the mist does give such dimension to the paper. TFS! A Fantastic and Fun card!! What a cool card....love the button idea. Thanks for sharing. Love your blog! Super cute! Love all those great buttons! Your wreath is super cute :) Already a follower. What an adorable holiday card, love it! What an adorable card! Love the button wreath! Oh my, this card is just so whimsical with those buttons! LOVE the colors too! Already a follower! Love your cute button weath! Fantastic work! What an adorable idea! A great way to motivate people to get creative!